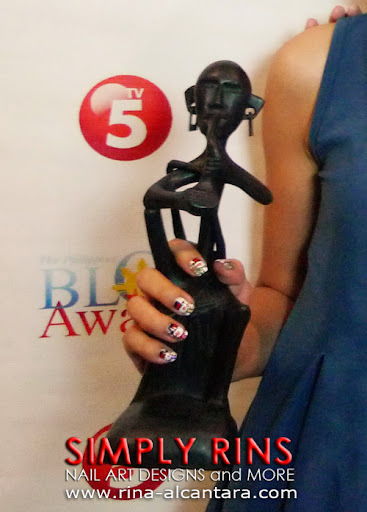 Simply Rins grabbed the Best Beauty and Fashion Blog, Luzon Level, in the recently concluded 2011 Philippine Blog Awards (PBA). And we were a finalist in the same category for the national level. The awards night was held last December 03, 2011 at the Carlos P. Romulo Theater, RCBC Plaza in Makati City. The Philippine Blog Awards happens every year since 2007 and its goal is to give recognition to outstanding blogs here in the country. Being a finalist already made me ecstatic. Winning was definitely an icing on the cake. It has been a little over a year since I transformed Simply Rins into a nail art blog. I've had my shares of ups and downs. The worst that I have experienced is meeting or encountering people that reacts with an odd expression when I tell them that I blog about nail art. They simply don't get it. This is NOT just a nail art blog. Simply Rins is not just a gallery of nail art designs. It has become an opportunity for me to reach out to all those who share the same passion. It continuously challenges me to develop my skills and creativity so I or my nail designs can serve as inspiration to others. But most importantly, this blog encourages self expression, regardless of form. This is me, accepting the award. If I am not mistaken, this is the first time a dedicated nail art blog has been recognized by the PBA. I am hopeful that this recognition can somehow change how some people think that nail blogs do not really amount to anything. I also hope that this will serve as an inspiration to all nail or nail art bloggers out there to continue painting their nails because we put more than nail polish or nail art on the table. The trophy and my Snowman Parade nail art design. I apologize for my serious sentiments. This really means a lot to me and I want to believe, to the nail art community. And so I SHARE this recognition to all nail/nail art bloggers. Particularly to fellow Filipina nail art blogger -- Trixie of Nailfiled, who was also a finalist under Best Beauty and Fashion Blog in the national level. I thought that the award would be the highest point of the evening. There was something greater. A few minutes after we got out of the theater, a few girls introduced themselves as my readers. I was totally overwhelmed and was practically speechless. I never imagined how wonderful it is to meet followers of my blog. They even asked if they could take a photo with me. I sort of felt like a celebrity. Really. If you girls are reading this, thank you. You made my evening perfect. With my very supportive parents. So many opportunities knocked this year for Simply Rins and I know that none of them is possible without my family, my friends, and my readers. From the bottom of my heart, I thank you for your support. Thank you for all the messages that you sent me, for all the comments and suggestions. 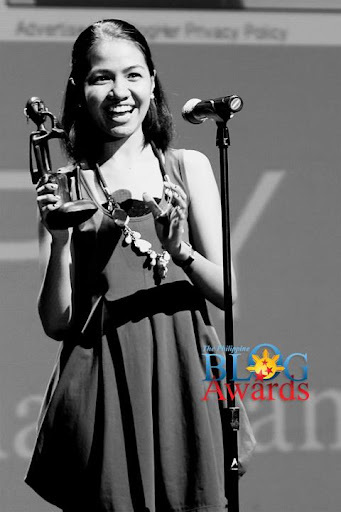 And of course, thank you to the Philippine Blog Awards for the recognition you have given my blog this year. Special thanks goes out to 2 of my very good friends, Fitz of Ready To Be Rich and Don of Bongga Ba. Their support, generosity, and encouragement is overflowing. 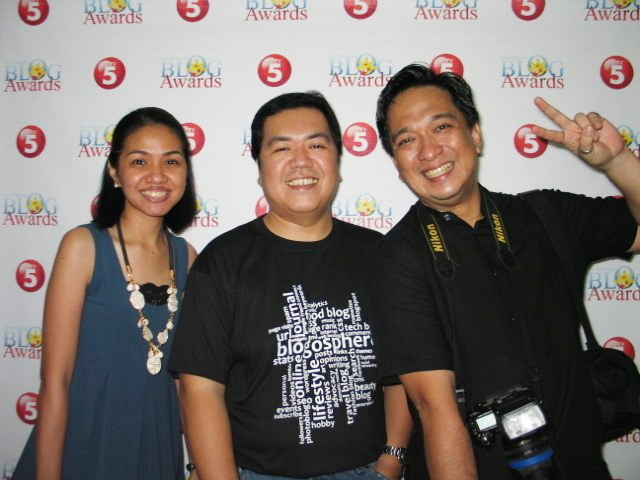 Fitz won 2011 Best Business Blog (National) for the second time and Don grabbed 2011 Best Lifestyle Blog (Luzon). Me, Fitz, and Don during the PBA 2011. I also had the chance to catch up with a friend way back in high school, Mitzi. She won 2011 Best Food and Beverage Blog (Luzon). You can check out her awesome food blog here. It was so nice to see you after a very long time. My sincere congratulations to all the winners of the 2011 Philippine Blog Awards! Video courtesy of my mom. or subscribe to Simply Rins via reader. Congratulations! it's just about 3 months ago when I started reading and following your blog. and i can say that you are not just an inspiration but a hope to me. A hope that one day, nail enthusiasts, like me, will also be recognized not just here but even outside Philippines. I can only imagine your happiness right now. Again,congratulations and I do hope you will keep on inspiring girls and bloggers just like me. Kudos! Your blog is amazing, you are so talented and deserved the prize. Way To Go Rins!! I am a follower from North Florida who is truly inspired by your art and passion. Thank you so very much!! Hiii Ms Rina! This is Cat (or Denise, however you want to call me) haha, the niece of Don Triviño. :) Congratulations again! Checking out your site now, and you undoubtedly deserved the win. See you again soon! BONGGA!!!!!! BONGGA KA NA DIN!!! Rina..heartiest congratulations to u!!!!!! I am extremely happy for you!! U totally deserve this and much more! (hugs)!!! U deserve this and much more *-* kisses! Congrats! That's awesome! You definitely deserve it-love your nail art and your b log! Oh WOW! Congratulations Rins! I just love your blog and you are right, we are sharing more than nail art here. The support and creativity that is shown on nail blogs is really wonderful. Congratulations for your achievement! I really hope this is a start for nail art blogs to be recognized as more than just parading nail designs. Just saw this and I'm amazed! Congrats! (^_^) I think you deserved it.